Sunday 4.30am Jesse Neagle, Clayton Baker and myself left Hamilton for Kariotahi beach. The swell map and forecast had predicted conditions to be perfect for kite fishing, 15-20 knots ENE with a one meter swell. We hit the beach at around 6.30am and headed south around five kilometers. We had a two Longline Rigs. One was powered with a brand new Mega Mouth Kite the other with a Nighthawk Kite. The rigs were set 200 metres apart and let out 1200 metres offshore. Both rigs were baited with a mixture of salted bonito and arrow squid. We retrieved the first set after 45 minutes with poor results, 10 sharks on the first rig and nine sharks on the other. Undeterred at the absence of snapper and the abundance of sharks the lines were reset again, two hours later we hauled them in again. It was a great result, the first line had a 20lb snapper and a 5lb snapper, two kahawai and five sharks. The last set only managed two pan sized snapper and eight sharks. 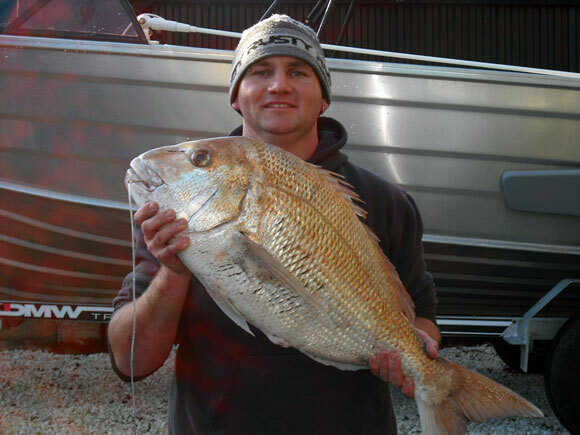 This was a good days fishing as it was my biggest snapper from Kariotahi Beach to date. Being addicted to kite fishing I decided to hit Mokau and show my mates what real snapper look like - they were used to the sprats that they normally catch at Waihi Beach! Jesse Neagle and myself headed down after work and met Cameron Board and his mate Chase at the Awakino Batch. They both had taken Friday off so they tried surf casting at the Mokau River mouth to catch kahawai for bait for the kites but were unsuccessful. Both his rig and mine headed out into the darkness - hopefully going straight out - and were left for an hour and a half to fish. The results of the first sets were poor, 12 carpet sharks and two gurnard on my rig and eight carpet sharks and a gurnard on theirs. Wet and thirsty we headed back to the batch for a few drinks. Saturday morning we were up before dawn and back down on the beach, the wind was more to the north but still had a bit of easterly in it. I helped Cameron and Chase set up at Seaview and with a big tack on the Power Chute they wound up fishing nearly dead straight offshore. Jesse and I set up further down the beach at my favourite spot. We put the powerful Megamouth Kite on and set the line 1200 metres out and let it soak for three hours. Pulling my first set in was very heavy and you could feel big fish banging on the line as we hauled. We called them as sharks but we were very wrong, big snapper after big snapper came in - nine fish in total - they weighed in at 20,15,14.12,10,10,9 pounds respectively, plus a couple of pannies. It was simply awesome! Cameron and Chase were blown away! 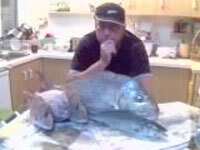 You don't get fish like that at Waihi Beach Chase remarked, they just couldn't believe it either! The next job was to haul Cameron's set. His kite had fallen when the wind stopped and had drifted way down the beach, nevertheless he pulled in two snapper, one nine pounds the other four pounds, he also caught four kahawai and a gurnard. 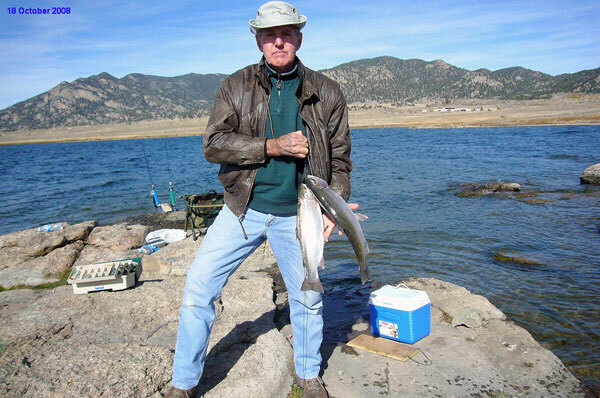 We bumped into Geoff Preston who had been whitebaiting and he didn't believe our catch until we opened the chilly bin. Awesome! 27th September: Peter Walker and I went back to our Spot X. We had a westerly wind which was really blowing so we used the super kite on the high wind setting. Second Set: Only One gurnard and a couple of pannies. I got my camera out only to find I had brought a box of film instead, so had to take the pics at home. For some unknown reason I always seem to get my best catch on my first set of the day. The eight pounder took up the length of my fish bin. Sunday 16th August: Went to one of my favorite east coast spots and encountered huge surf and a very strong rip to the right hand side also big sweepers like west coast surf. It was very odd - I had to deploy the skyhook to pull the longline out through the rip it was so strong. We had a huge bow in the line and only caught a couple of pan sized snapper and two kahawai. The tide came in much faster than it should have so we had to get the hell out of there quickly. There was not a lot of room for driving on - it was really dodgy. On a brighter note a bloke further down from me came off the beach with one of the largest snapper I've seen for some time. Must have been 20 pound plus. I was sorry I didn't take the camera but will do from now on. He said he got it on a seahorse kontiki. Now I am not running the units down but in his own words told us all that the rip turned it and then it did a big half loop trying to return to terra firma. Anyway, it was lucky the big snapper was lurking in close because the kontiki only managed to get less than 300 metres offshore. 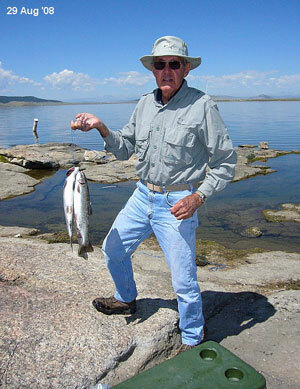 Here is picture of my first twenty pounder caught on a kite this spring. 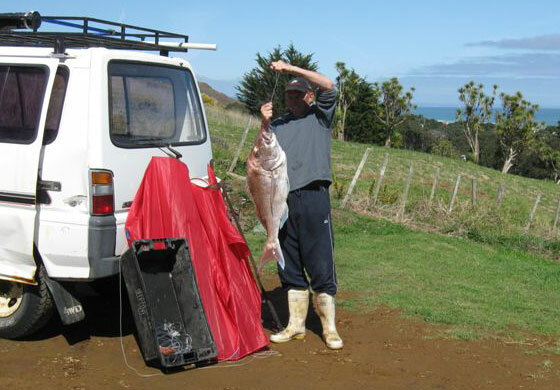 I caught it on Monday morning 14th Sept while fishing with the 1800 metre Kite Longline Rig, I used the Mega Mouth Kite and fresh kahawai for bait. The snapper weighed in at 9.3kg. 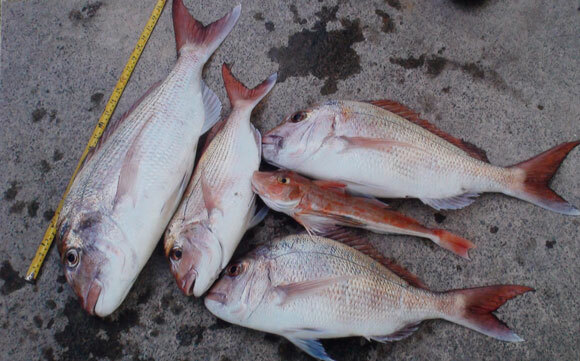 The same day a kontiki fisherman got an 8kg snapper and two others around 5kg each. The next few months here is very good snapper fishing - this is when most of the really big fish are caught. Just a brief note to thank you for the good fishing tips you provided to me during my visit to your shop. One tip in particular has already helped. That is - knowing how to determine the drag on the spinning reel - and setting it to a proper pull relative to the weight of line used. I took your advice and was able to land two 19 inch and one 18 inch trout that may have had their way on my ultra light tackle if the drag on my reel was too loose. Also, I think my casting distance is a little better after following your advice. Next step. review your website! I enjoyed talking with you and will try to come by again next time I'm down under. Floating Beads and Running Main Float Perfect for Rocky Sea Beds and Kelp by Lorraine Heskett. Many kite fishers only go to the west coast and avoid the east coast, but in a westerly wind the east coast can be a really good alternative to staying at home. When I go to an east coast beach I prefer fishing at a beach with intermitted flat papa rock, although I often have to pay the price of losing some gear. This weekend I tried a different set-up by making 10 traces with floating beads and using a running float. I fished in pretty windy conditions and had to retrieve the 65kg dropper rig twice, because it was under weighted, but then I was able to run two proper sets. I only fished about 400m offshore and waited about 30 minutes before I retrieved and this time, with the floating beads and the running float I hadn't any problems with stalling or losing gear in the rocks. I was able to catch nine snapper, not the biggest, but on average 1.5lb and it shows that the snapper are definitely back at the east coast. It was another great fishing day and thanks to Paul's floating beads and the running main float there is no reason anymore not to fish on beaches with flat papa rock or a bit of weed. Read the full article on using a running float rig to reduce snagging. Here is a pic of a 750mm long snapper with three others about 40cm each and a kahawai, the five fish were caught on a pocket sled rig with only five hooks on a single haul. I was fishing from a sandy beach about 5 years ago and set the gear out about 10pm at night, it was blowing 35-40 knots. I had a Flexiwing Kite Rig tacked from a sou' sou' wester' fishing 1km straight out off a beach reel with 10 hooks. I also set a Large Pocket Sled from my rod on a 45 degrees angle 700 metres out with five hooks to the left of the flexiwing rig. My wife was seven months pregnant at the time, she was lying on a mat on the beach complaining about the wet and cold and wanting to go home. Just wait I said, I will to pull the gear in as fast as I can. Well, I pulled in the flexiwing with 10 hooks - nothing - damn! I thought to myself that was a waste of time. Then I started to wind in the rod, hell I thought, I didn't think it was this hard winding in a pocket sled rig, next time I thought I will have to get a gimble and harness. Anyway the pocket sled kite was moving 45 degrees off wind to the left then 45 degrees to the right. I thought that wind must be very turbulent out there. Then, after what seemed like ages of hard winding at last I was walking down the to pull in the hook section. Oh good I thought as I spotted a kahawai, no need to pay for bait next time, then - one after the other - three snapper averaging 40cm, even better I thought, at least I won't be told off for not catching any fish. Then on the very last hook I saw a huge snapper, I had to gaff it as was so heavy, it looked as though the hook could pull out at any moment. I walked back up the beach where my wife was lying on the beach mat, and lay the whole catch out on the sand and went to get the scales. There was an Austrian couple in a camper van that we had talked to while fishing here before. When they saw me weighing the biggest fish they were straight out of their van and running towards me. After satisfying their curiosity they all wanted a pic of themselves holding the big fish which tipped the scales at a very respectable 18 pounds. Even the wife had forgotten about the wet and cold and had a smile on her face after seeing the great catch we had managed. A special thanks to all those who took time to send in reports. If you would like to send in a report please use this easy to fill out catch report form or Contact Us your fishing report and pics directly to us.